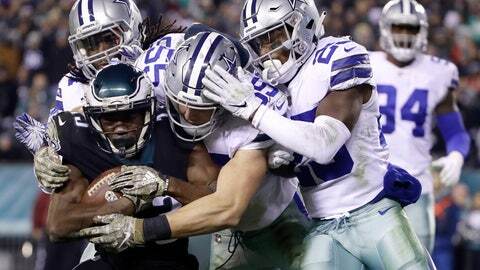 PHILADELPHIA (AP) — The Philadelphia Eagles are closer to being the eighth defending Super Bowl champion to follow up with a losing record than becoming the ninth team to repeat. A season that began with promise has been a major disappointment. The offense is inconsistent, the defense has wasted several leads in the second half, and a slew of injuries has left the team short-handed in key areas. Still, the Eagles (4-5) are in the mix in a mediocre NFC East. “There is a level of frustration, but listen, we’re very close,” coach Doug Pederson said Wednesday. “We’re so close in a lot of areas. You look at our output and production offensively, we’re very similar to where we were last year. The Eagles have lost three straight games at home, including 27-20 to the Cowboys (4-5). They have four games remaining against division opponents, including two versus first-place Washington (6-3). Next up is a difficult game on the road against the New Orleans Saints (8-1). Philadelphia is a 9-point underdog. Pederson spoke to the team’s leadership committee before practice to get a sense of morale and came away optimistic. “They’re all disappointed obviously in the performance the other day,” he said. “They’re eager to get back on the practice field and they’re excited for this week and this opportunity. I think they understand what’s in front of them. The Eagles overcame several key injuries last season on their way to a 13-3 record and the franchise’s first Super Bowl title. Nine-time Pro Bowl left tackle Jason Peters, running back Darren Sproles, linebacker Jordan Hicks, special-teams captain Chris Maragos and Wentz each sustained season-ending injuries. Already, running back Jay Ajayi, safety Rodney McLeod and cornerback Ronald Darby are out for the rest of this season. Sproles has only played one game, wide receivers Mike Wallace and Mack Hollins are on injured reserve, defensive tackle Tim Jernigan hasn’t returned yet from offseason surgery, and Maragos also hasn’t come back. The Tampa Bay Buccaneers were the last champion to have a losing record the following season when they were 7-9 in 2003. NOTES: CB Jalen Mills (foot), DT Haloti Ngata (knee), TE Joshua Perkins (knee), and Sproles (hamstring) didn’t practice Wednesday. T Lane Johnson (knee) and CB Sidney Jones (hamstring) were limited.